Duiyuemen is an original gate from outlying walls. Long gone is the Great West Gate from Tainan. 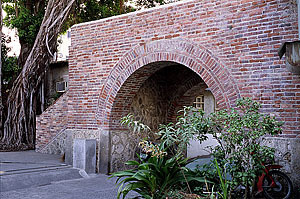 The Small West Gate still exists in Tainan, but it has been relocated to the NCKU campus in the east of the city. 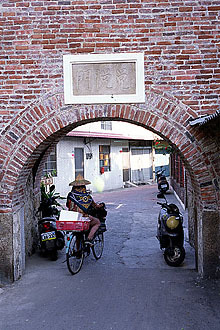 Still, the western part of Tainan does have a gate that remains in its original location. Duiyuemen was not part of the main city walls. It is a small gate that was built into outlying walls that served the expansion of the city to the west. This gate is named duì after the western direction in the eight trigrams (bā guà 八卦), a key diagram in Taoist cosmology. There were two other gates in this series of western walls (Diankun and Gongqian), but they were torn down with the rest of the gates and walls over the years. In its time, the gate was meant to strengthen city defenses. Now it is simply part of a neighborhood and a reminder of the walls that once protected the city. Duiyuemen was completed in 1836. 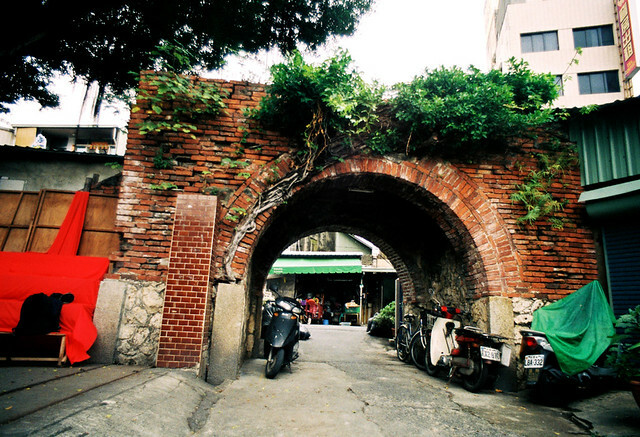 The Qing rulers had been building walls around Tainan since the 1720s, but the city was growing and the important port area of the five channels district existed outside of these walls. City defense against foreign invaders was one reason for the addition of walls, but rebellion against the Qing government was commonplace. The 1832 uprising known as the Revolt of Zhang Bing (張丙) largely inspired the building of the walls in the northwest of Tainan City. Duiyuemen is just part of the neighborhood. The gate is about four meters high and three meters deep. The arch is less than three meters wide at its base and height. It was constructed using bricks, coral stone and mortar. There are stairs next to a large banyan tree that’s to the left of the gate when you’re standing on the eastern side (i.e. inside of the city wall). You can climb to the top of the wall and have a look around, but the view is only one story high. A stone lion guards the gate from evil spirits. The gate is small and not particularly spectacular. What’s nice about this gate is that it has been integrated as a simple character piece to what is a traditional working-class neighborhood in the city. People who live there pass through it daily on their bikes and scooters, or view it as an impassable obstacle if they’re driving a car. While it’s hidden away from most of the city, it is a nice piece of residential history for the people who live in the neighborhood. It may seem strange that this gate is a second class national historic site, while the Great South Gate and the Great East Gate are merely third class. I can think of no reason for this except that the gate has changed less than the others. The gate was damaged by an earthquake in the 19th century, but by and large it is quite original in its current state. This lesser gate has stood the test of time and remains as it was in the 1830s. 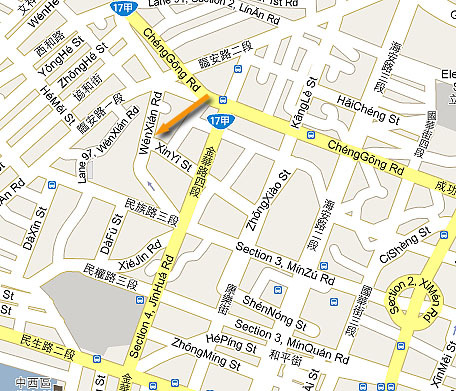 Duiyuemen lies at the intersection of Wenxian Road and Xinyi Street, concluding the Old Five Channels Cultural Zone Walking Tour should you choose to take it. Wow, looks like the city did a restoration job on it recently! Last time I was by there about a year and a half ago, there were banyan trees growing all over it and on top, too. Looks nice now, but I don’t know…. I rather liked the trees there, too!